Tayrona and Sierra Nevada de Santa Marta National Parks and their Archaeological Sites is part of the Tentative list of Colombia in order to qualify for inclusion in the World Heritage List. As I understand it, the current iteration of this nomination consists of two National Parks, Parque Nacional Sierra Nevada de Santa Marta, and Parque Nacional Natural Tayrona, each containing an interesting archeological site. The parks are close to each other, and to the city of Santa Marta, which serves as the gateway to the site. Tayrona Park is the smaller of the two, and is located on the Caribbean coast, while the larger Sierra Nevada Park is slightly inland and its mountainous terrain creates a more humid biome compared to the surrounding area, which is semi-arid. The latter park is also noted for its high peaks, which are often snow-covered, and the paramo habitat that exists at higher elevations, though these features are not readily visible from the areas accessible to visitors. Both parks, as well as some of the surrounding areas, are still home to the four indigenous groups that make up the Tayrona Culture. It was their ancestors who originally created the settlements that are now the archaeological sites included in the nomination. The smaller of the two sites is Pueblito, in Tayrona Park and it is reachable independently as a day trip involving a hike of a few kilometers at most. The larger, more interesting, site, Ciudad Perdida –the Lost City– is deeper inside Sierra Nevada Park, and can only be reached by a 4-5 day round-trip walk organized by a local tour company. It should be noted that the Tayrona Park section is closed for the entire month of February each year, while the Sierra Nevada section is closed for the month of September. So, anyone desiring to visit both sections should take that into account. There are around four or five companies running tours to Ciudad Perdida, all based in Santa Marta. I used Baquianos Tours (www.lostcitycolombia.com), one of the more established companies, and they were quite efficient at responding to e-mail inquiries and making my booking. The most common walk is the four-day option, which is what I did, and I learned later that the 5-day version does not shorten the distance walked each day, or does not spend much more time at the Lost City, but rather, includes an extra “rest day” along the return trip, and so might not be worth the extra cost. My tour cost around $US 300, though I had the feeling that some of the other people in my group may have paid more than that. However, I decided not to stir things up by investigating that further. My group consisted of 9 people and three guides, one lead guide, a Colombian man from the local area, one young Venezuelan, and one Venezuelan man, who was the groups bilingual (Spanish/English) guide. Together with the groups guided by the other companies, there were about 50 tourists heading up the mountain on the day we departed, with others from earlier days making their way back down. With that level of participation, the walk did not provide for much solitude, but also didn’t feel too overcrowded. Almost all of the other tourists were of the gap-year/backpacker variety, who often seemed more interested in socializing and selfie-taking than observing the nature of the Park, so I was a little out of my element, but it was a fun group, nevertheless. The walk is fairly strenuous, mostly due to the heat and around 800 meters of total elevation gain, but the trail itself is not especially technical. It was very dusty in some places, however, and in the wet season would probably be much less pleasant. Accommodation is at permanently established campsites, with dormitory-style, netted bunk beds, and basic facilities for washing. Three meals a day are included, and their quality was surprisingly good, considering that all consumables must be packed in in advance using burros (donkeys). There are also small stands along the trail run by local residents which sell water, drinks, and fruits, and these were very much appreciated. 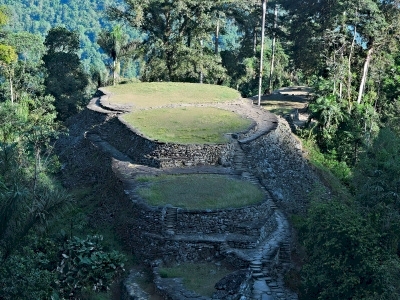 I found the archaeological site at Ciudad Perdida to be quite interesting and picturesque. It is located at 1,200 meters elevation and tours spend a few hours there on the morning of the third day. It consists primarily of the circular stone foundations of former homes and other buildings, arranged around a few terraced levels of flat ground in the otherwise hilly terrain. These formerly contained buried caches of precious items in their centers, but those had all been looted in prior years (some disturbingly recently). The site also consists of some stone walls, maps carved in stone, and staircases, including the thousand-year-old one that provides the final 200 meters of elevation gain before reaching the ruins. It is thought that at its peak, the town housed around 2000 residents. I believe that this site possess significant cultural value, most notably resulting from the distinctive design of the original settlements, representing a town style that was notably different from neighboring cultures. There are few similarities to either the Mayan or Incan style of urban design, which would have been the two closest major societies. I feel that this nomination should definitely be inscribed, most likely as a Mixed site. It is true that the presence of tourists and the indigenous Tayrona people, who live sustainably within the boundaries of the parks, means that the parks do not often feel like a true wilderness. However, the parks, taken together, are quite large and there certainly must be many areas devoid of tourists and residents which are more pristine. Additionally, the high level of biological endemism found in the region represents a factor that I usually feel supports the case for inscription. The Tayrona people are well known for the disdain they feel about the way contemporary societies are damaging the natural world (they consider the rest of us to be the “younger brother”,) so if inscription leads to more protection for the parks, without major changes imposed on their way of life by UNESCO, then they will likely be supportive. Read more from Michael Ayers here.